We visited J's Oysters for our last big meal before heading back to NYC, and as soon as we had our first bites, we realized it should have been our Saturday dinner and Sunday lunch spot! (Our Saturday dinner was pretty terrible, but more on that in a later post). 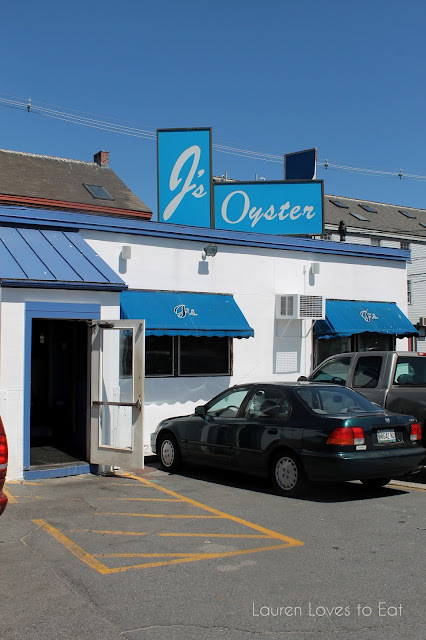 Although there are a few windows in J's Oysters', because of very dim lighting, it's very, very dark inside. It took my eyes a few seconds to adjust when walking in and out. Since the pier area is filled with tourists, it was a pleasant surprise to see that the restaurant had quite a few local patrons. The dining room keeps decorations to a minimum, which was interesting to see, as my frequent seafood haunts in NYC all include nautical-type decors. I suppose when the establishment is actually oceanside, it's instantly more authentic and doesn't need to try quite as hard. Our server was very helpful and made us feel right at home. Her hospitality, combined with what turned out to be the most incredible seafood feast, made this my favorite dining experience in Portland. J's Oysters is very close to Standard Baking Co., and just 4 steps away from the pier. 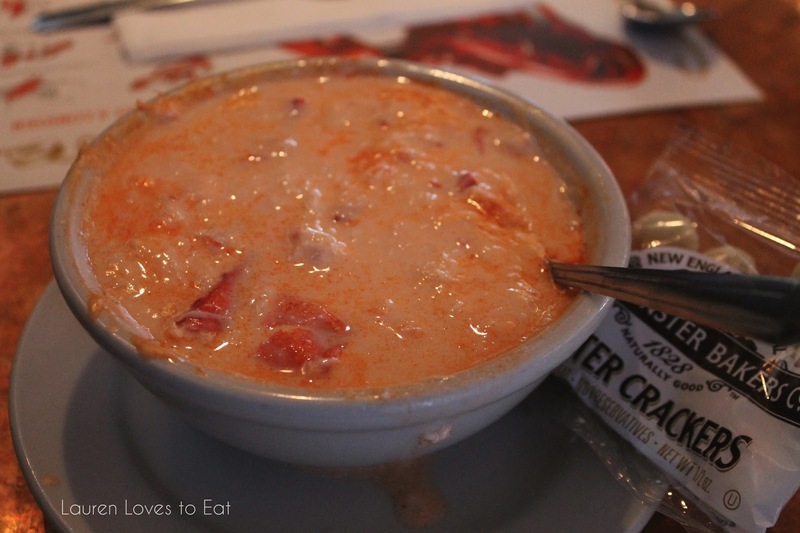 Lobster Stew (bowl), $13.50: Deliciously white, creamy broth filled, and I mean filled with chunks of lobster meat. 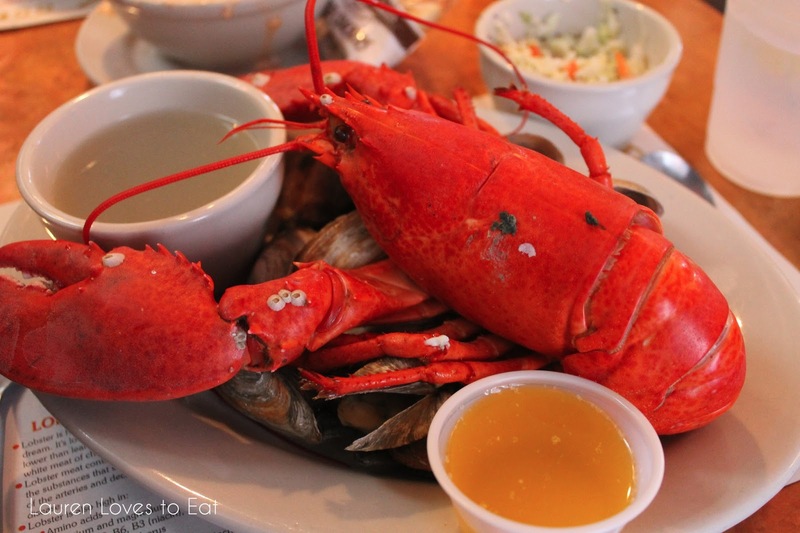 Endlessly satisfying, but we tried to stop ourselves from finishing this off in order to save room for our whole Maine lobsters! Important note: we ended up coming back to what was left of this after we finished our entrees, and the stew was good even when cold. Maine Lobster, $28 (market price): Lobster, Alaskan king crab legs, broth with steamers, cole slaw: This 1 1/8 lb lobster was ridiculously fresh, and even though it was good enough alone, of course I had to use up my entire little melted butter dipping sauce. The broth was perfect with great salinity. It did have me yearning for noodles though. (Plain broths always call for carbs!) Lastly, the steamers had minimal sand in them; always a good thing. Side of coleslaw (part of the Maine Lobster dish) atop a paper placemat with instructions on how to eat a lobster. 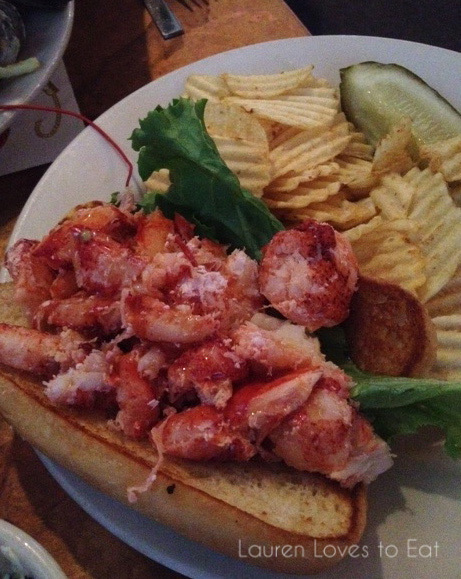 Lobster Roll, $13.50: Very fair price for a beautiful overstuffed lobster roll complete with potato chips and a pickle spear. 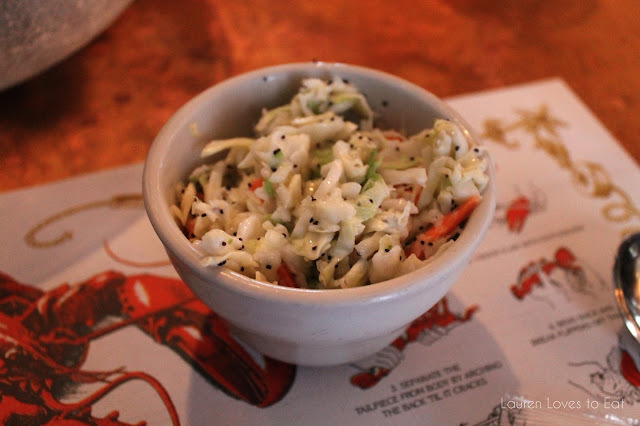 I prefer the fancier lobster roll from Eventide, but I did enjoy this more authentic and no-fuss tasting one as well.